You can tuck into two home-cooked courses from just £11.95 at your local Brasserie Blanc with our wonderful set menu*. This month our seasonal star is the plum – brilliantly British, fabulously flavourful and very versatile, our executive chef has had a wonderful time creating this month’s transitional dishes. Begin with our plum, tomato & feta salad which showcases the Victoria plums in their glorious original form. 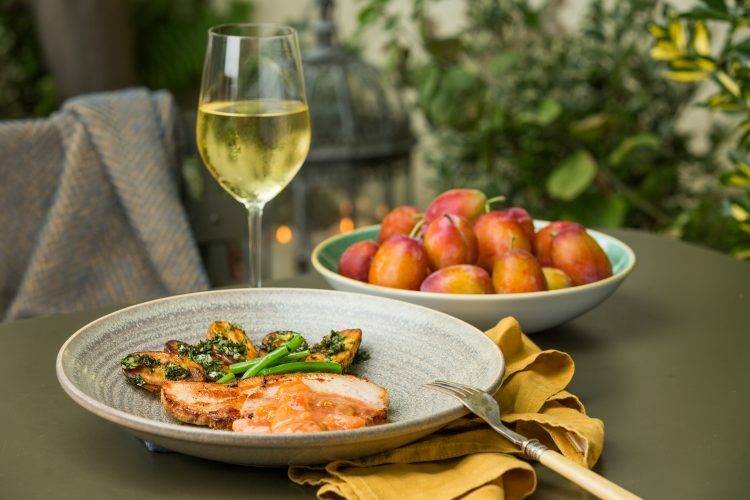 Follow this with our succulent slow-roast pork sirloin, accompanied beautifully by our home-made plum sauce. For dessert, enjoy stewed plum & apple compote topped with almond crumble and lashings of double cream. As always, our sensational set menu is fresh, seasonal, home-cooked and available now. View the full menu and book your table today. *Set menu available from £11.95 at selected times and dates at different BB restaurants. Please check exact details on your preferred location pages. Not available at Threadneedle Street.